Getting kids to eat veggies is a struggle for almost every mama! I don’t even like eating them myself (but I do it), so I can certainly sympathize with the picky eaters who love to refuse the green stuff. A few weeks ago I discovered something that has caused my children to beg me for vegetables. I’m not even kidding. My 3 year old, pestering me until I give him more. Want to know my secret? I served him frozen vegetables. Maybe it was the cold/crunchy feeling of them. Maybe they numbed his tongue so he didn’t realize he was eating healthy food, I have no idea what it was. But he thought it was a special treat and he often asks for more. I know this tip won’t work for every kiddo (but it’s worth a try!). Since we all have to figure out what works for our own little ones I took to the blog’s Facebook page, to see what advice all of you could offer. I found some more GREAT tips, that I’m definitely going to put into practice once the novelty of vegetables served frozen has worn off. 1. Buy Something New – Growing up I remember being served the same few types of vegetables over and over. I didn’t like most of them, so everyone assumed I didn’t like vegetables in general. When actually, there are plenty of vegetables I enjoy, but to this day, I don’t enjoy lima beans, or peas (two of the most common veggies served at home when I was growing up). If your kids aren’t responding well to the types of vegetables you’re serving, get creative and try something else. Bell peppers, eggplant, brussell sprouts (my son calls them “little green balls” and LOVES them) or something else out of the ordinary. 2. Let Them Choose – Take the kids to the grocery store, and let them choose which vegetables you buy for the week. If they have a hand in selecting them, they will be more likely to eat them once you put them on the table! 3. Make Veggie Muffins – Having veggies for breakfast might not be the norm, but it doesn’t matter the time of day, as long as they are eating them! 5. Make them cute! – Make some fun designs in their veggies to make the child’s first reaction to giggle, not spit it out! 6. Serve Them In A Tray – In Dr Sears’ book, The Portable Pediatrician (affiliate link) , he suggests serving all types of chopped vegetables and foods in an ice tray, with some yummy dipping sauces on the ends. Making it fun, colorful and full of variety can encourage little ones to eat more vegetables. 7. Hide Them – Sneak them in things like spaghetti and lasagna – Sarah says: “I find the color and taste of tomato sauce covers a multitude of other things and they hardly notice, lots of cheese doesn’t hurt either”. Zucchini brownies are another yummy option! 8. Serve Them As Snacks – You could leave a plate of raw veggies on the table for the kids to snack on between meals – Becky said this is the only way her son would eat vegetables for year! Kelli says she only serves vegetables for snacks, no chips or anything else. If they are hungry between meals (and kids always are), they have to eat their veggies! 9. Serve Them First – Put Vegetables on the kid’s dinner plates before anything else, that way, they have to finish the veggies, before they get the meat or anything else for dinner – This idea came from Jilly! 10. Food Process Them – Do this until they are unrecognizable and hide them in anything and everything! – Thanks to reader, Kristi for this awesome idea! What is your best tip for getting your little ones to eat their veggies? Which of these will you try next? 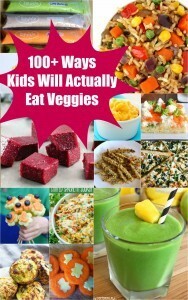 If you are looking for ways to sneak vegetables into foods your kids already enjoy, check out over 100 ways kids will actually eat veggies! I have to make a comment on the “hide them” option, too. Some people balk at this idea, finding it sneaky or deceptive. But it doesn’t have to be! I’m like you, and I don’t like veggies, either. For ME, if I can “hide” them, that just means that the taste is sufficiently disguised that I can tolerate them. 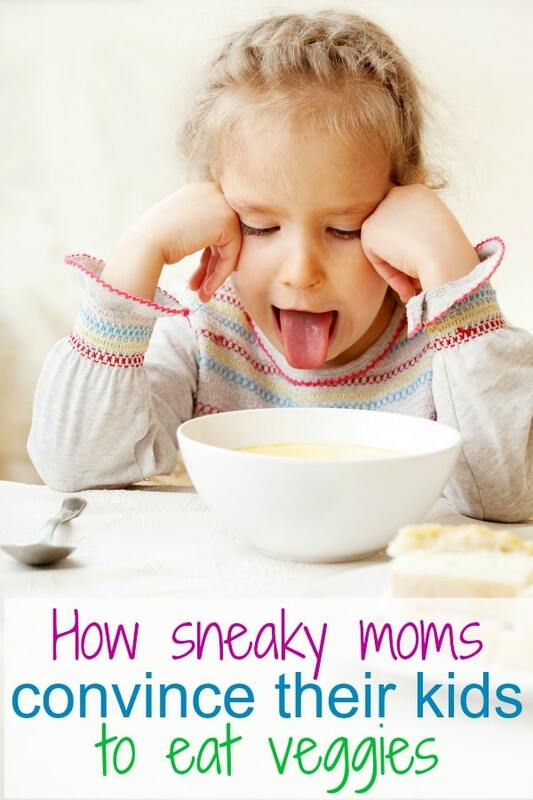 If that’s the case for me, then surely my children can also appreciate having the taste hidden so they enjoy their food more! I’ll have to try serving them veggies frozen–you never know! It could work! I’m pinning this since it was so helpful. Thanks so much for sharing this at Frugal Crafty Home Blog Hop! My aunt told me her, and her son would eat frozen vegetables in place of ice cream. He is grown and married now and they both still like to eat vegetables like that. Something I should try with my little ones. I used to love frozen peas! We put ranch dressing on them and ate them all the time when I was younger! I find my kids are more willing to eat veggies that they help grow so I have them help me plant my garden every year! These are great! I especially love the idea of giving veggies to the kids frozen! That might also be great for teething… Thanks for sharing! I find that number 2 is very important. I have observed when children have a choice of their food, they surprisingly make good choices. 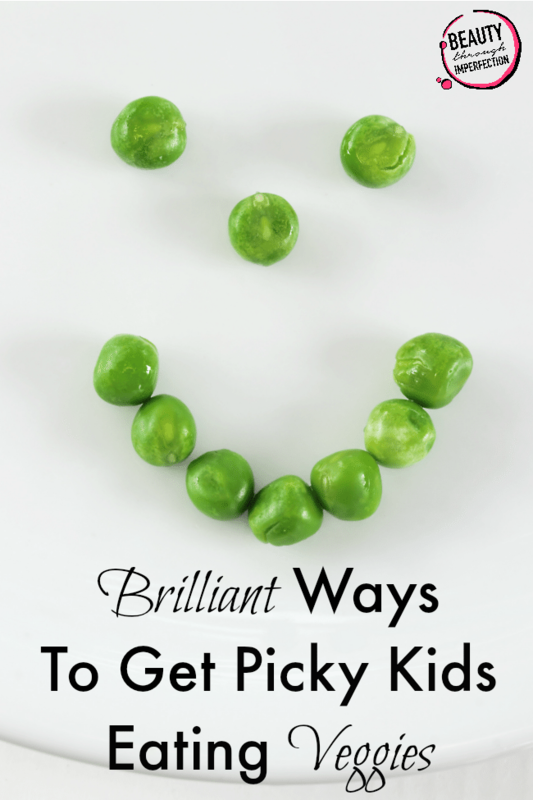 Hey Buddy!, I found this information for you: "How to Get Picky Kids to Enjoy Their Veggies". Here is the website link: https://www.beautythroughimperfection.com/kids-eat-veggies/. Thank you.